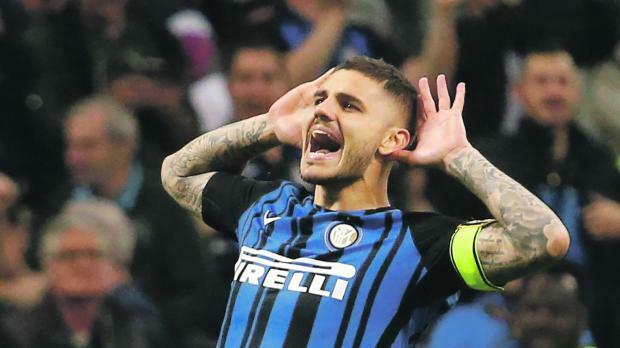 Mauro Icardi, the joint top goalscorer in Italy's Serie A this season, was left out of Argentina's World Cup squad on Monday as coach Jorge Sampaoli named his 23 players for next month's tournament in Russia. That meant there was no place for Icardi, who scored 29 league goals for Inter this season. Although Argentina boast some of world football's most prolific strikers, they have struggled for goals in competitive matches, scoring just 19 times in 18 qualifying matches in the South American group. Only Bolivia scored fewer. Another surprise in Sampaoli's 23 was the inclusion of Torino defender Cristian Ansaldi. "I decided on Cristian Ansaldi because he is a full back who can play on both sides of the field," Sampaoli told reporters. Uncapped River Plate goalkeeper Franco Armani was also a surprise inclusion, named along with Manchester United's Sergio Romero and Chelsea's Willy Caballero. Sampaoli said the squad is one "that attacks with the ball, that plays the game, that goes looking for a result. I think that Argentina have great potential with lads who really know what do to with the ball." The South Americans, who lost in the World Cup final four years ago but only qualified for this year's tournament thanks to a win in their final qualifying match, have been drawn in Group D alongside Iceland, Croatia and Nigeria. "If we are up for it and play our game then we are going to be a complex opponent for anyone," Sampaoli said, adding that both Aguero, who missed the end of the English season with a knee injury, and Messi, are training normally. "I have spoken with Messi and I see he is very enthusiastic about what is ahead," Sampaoli said. "Physically, he is in good shape."